15 minutes for this fast soup recipe to get to the table! 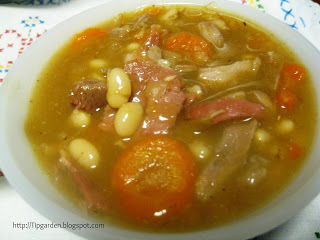 This Kielbasa Bean Soup tastes like you slow cooked it all day! In the time it takes to bake some Easy Parmesan Biscuits you can have the soup ready to serve too! As I write this I have a thunderstorm outside my window, which always makes me want a bowl of soup for some reason! 1) I always seem to have the main ingredients handy. 2) It's easy to clean out the fridge and throw leftover salsa or veggies in it. 3) It ALWAYS tastes slow cooked even if you threw it together! Please feel free to consider this a base recipe and play around with it! Jan's tip: I have found that the ingredients that must be there for it to have it's rich layer of flavors (that give it a slow cooked taste!) are the Beef (or chicken) broth, Beef Gravy, Spicy Beans, and either regular or spicy tomatoes, the rest I just sort of use what I have on hand. Optional: 1 lb ground sausage, onions, green peppers, or any vegetable you have on hand. Throw all the ingredients together in a large sauce pan and heat on medium till bubbly and heated through. Ready to serve.